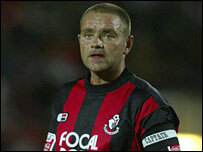 Bournemouth defender Neil Young has been recalled from his loan spell at non-league Weymouth. The Cherries had a 24-hour recall clause on the 34-year-old and have decided to use that option. Young has been recalled by manager Kevin Bond due to an injury to Josh Gowling and the departure of on-loan QPR defender Dominic Shimmin. Young has been at Bournemouth for over 13 years after joining them on a free transfer from Tottenham.